The RubiCam Camera Control Unit (CCU) connects to the RubiCam camera head by existing Toshiba (6mm) Camera cable up to a maximum of 30X Metres in length with appropriate length compensation. The CCU is powered by 12 Volts DC which can be supplied by the Toshiba AC Adaptor or any suitable DC source. The picture produced is 16:9 and has HD and SD outputs. The HD outputs of the CCU include HD-SDI, Y/Pb/Pr and the SD outputs include SDI, Y/C and VBS. The CCU is fitted with Full Duplex Fibre Port which can send Audio/ Data embedded in the HD-SDI signal down the line from the CCU’s two “Audio In” miniature Lemo 3X pin sockets. 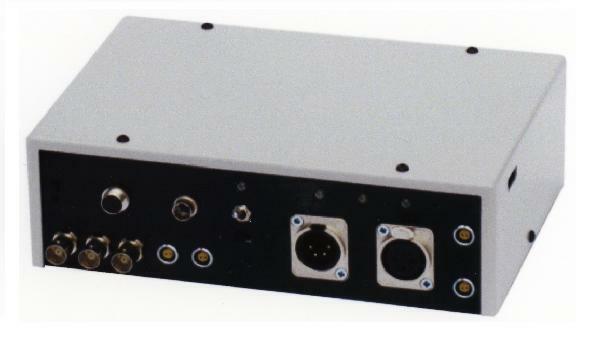 The HD-SDI embedded output signal can be interfaced with the SMPTE Hybrid Fibre Optical cable in order to connect to the Television Outside Broadcast Vehicles which may be situated some distance from the RubiCam CCU. As the Fibre Optical link is Full Duplex, Video and Audio/Data can be sent back to the camera position via the return path.